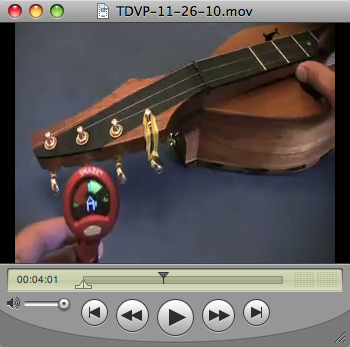 Dulcimerica 180 - "Tuning Up"
Just in time for the holiday shopping season - a look at some electronic instrument tuners on the market. If you're interested in attending the 2nd Annual Key West Dulcimer Fest January 27th - 30th, 2011 - please pre-register by joining the official mailing list. Dulcimerica 179 - "Dulcimers On The Green Pt. 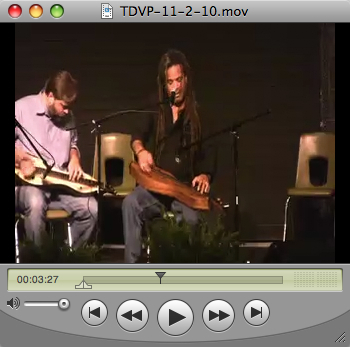 2"
From April of 2010: Bing Futch travels to Central City, Kentucky for the 1st Annual Dulcimers On The Green Festival. In this video, recorded at the Merle Travis Center, Stephen Seifert joins Bing for an improvisational groove before the two launch into "Folsom Prison Blues." Dulcimerica 178 - "Dulcimers On The Green Pt. 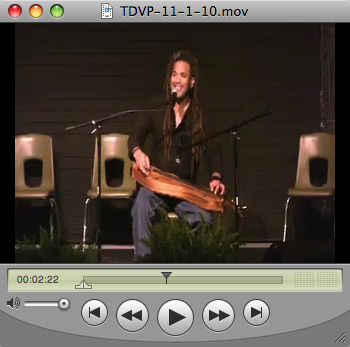 1"
From April of 2010: Bing Futch travels to Central City, Kentucky for the 1st Annual Dulcimers On The Green Festival. In this first look, we see Bing and Dan Landrum arriving at the festival and a glimpse around including fellow instructor Stephen Seifert. Then, upon arriving at the Merle Travis Center, we see Bing's performance of the original tune "Red-Headed Lover."